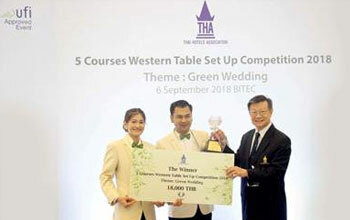 Congratulations for The representative of the hotel that win of “5 Courses Western Table Set Up Competition 2018” two years in a row. 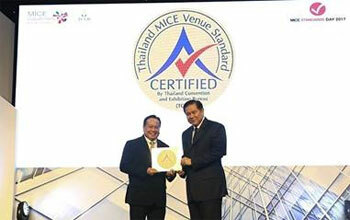 In FHT Food & Hotel Thailand 2018 Organized by the Thai Hotel Association. 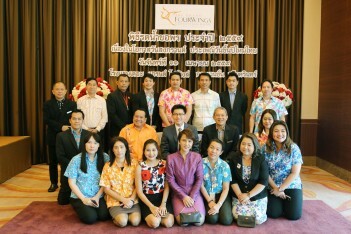 Mr. Viroon Jirapojaphon, Director of Finance. 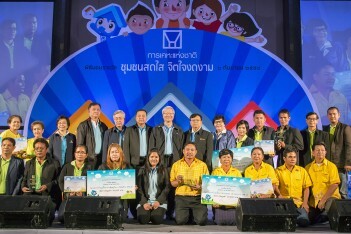 Recently give the scholarship for The Child of police in Children’s Day 2018, To the Police Lieutenant Colonel Wanphadet Hongthong representative of the Huamark station for Encouragement in duty. 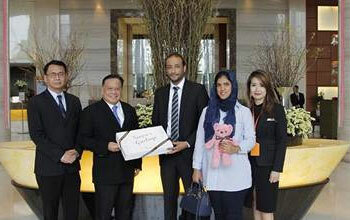 Mr. Peerapong Supourut, Hotel Manager, recently presented a welcome to Mr. Ahmed Abdulwahab Mubarak Abdulla, the Third Secretary Embassy of Bahrain in Thailand. 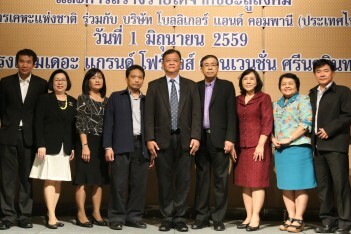 Mr. Daranai Inswang, Deputy Governor of the National Housing Authority, recently presided over opening conference “Social Business: National Housing Authority and Waste Monetization” at Pavilion Hall, The Grand Fourwings Convention Hotel Bangkok. 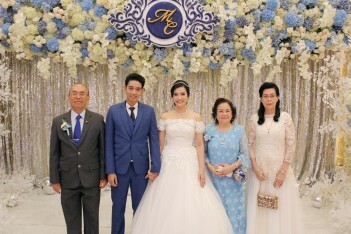 Mr. Piya Patangta, President of the Supreme Administrative Court, recently presided over the wedding celebration of Miss Maneenun Ningsanond and Mr. Chinopas Sukhonthapatiphak at Pavilion Convention Hall of The Grand Fourwings Convention Hotel. 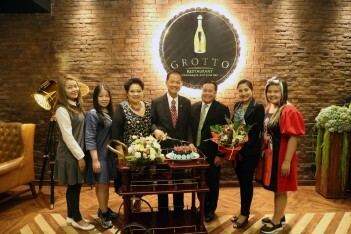 Mr. Peerapong Supourut, Hotel Manager and Sales team of The Grand Fourwings Convention Hotel Bangkok has launched “Hotel Sales Blitz” to promoted Accommodations, Meeting & Function Rooms, Restaurants and Facilities of the hotel at Bangpoo Industrial Estate, with great successful. Mr. Thanasak Suraprasert, Vice President. 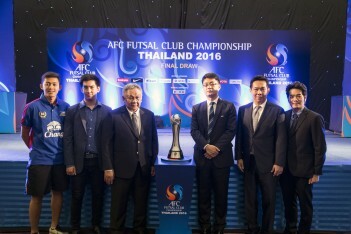 Football Association of Thailand and Mr. Shin Man Gill, Director of Completions Asian Football Confederation, recently held a press conference of “AFC Futsal Club Championship Thailand 2016 Official Draw” at The Grand Fourwings Convention Hotel. 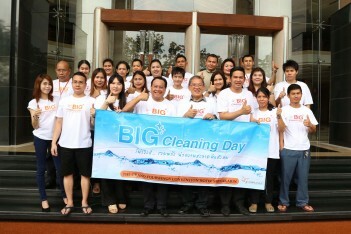 Mr. Peerapong Supourut, Hotel Manager of The Grand Fourwings Convention Hotel Bangkok, recently held an annual “Big Cleaning Day 2016” with the hotel’s management team join for the staff’s hotel in front of the hotel. 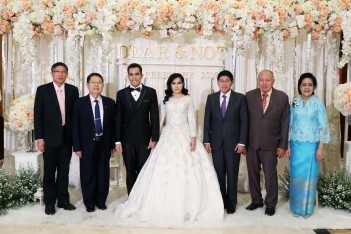 Dr. Wissanu Krea-ngam, Deputy Prime Minister of Thailand, recently presided over the wedding celebration of Miss Ploypaphat Pitipornpuwapat and Mr. Chayapong Saifah at Pavilion Convention Hall of The Grand Fourwings Convention Hotel. 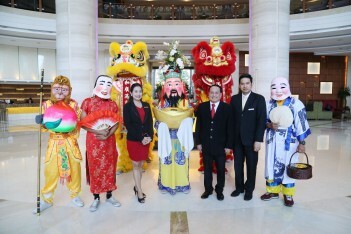 Mr. Worravit Pholab, Director of Food & Beverage of The Grand Fourwings Convention Hotel, recently held Countdown Party on the theme of “Café Fun Festival 2nd Countdown Party”, Mr. Prakit Chinamourphong, Honorary Advisor the Thai Hotels Association, The management team and The Staff of Hotel, join for celebrate a bid farewell to year 2015 and welcome New Year 2016 at Grand Café. 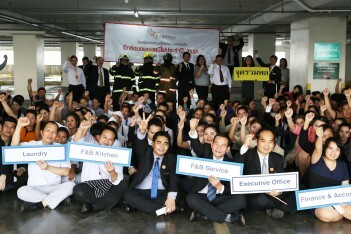 Mr. Ekachai Panyaroongcharoen, Director of Engineering of The Grand Fourwings Convention Hotel Bangkok recently held an annual “Fire Training 2015” for the hotel’s staff by Pol. Sen. Sgt. Maj. Viriya Wongdontree, Rescuer of public hazard as lecturer and trainer of Fire Hua Mark Station for fire rescue demonstration to ensure the guest safety. Pol. 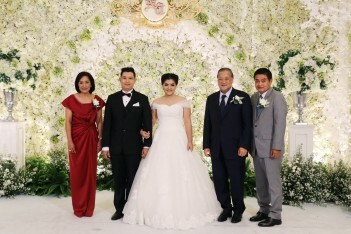 Gen. Adul Sangsingkeo, Ministry of Social Development and Human Security, recently presided over the wedding celebration of Miss Thananun Chinkitsiri and Mr. Wuttipong Puangkaew at Pavilion Hall of The Grand Fourwings Convention Hotel Bangkok, Srinakarin. The Sales Staff of the Grand Fourwings Convention Hotel Bangkok has been participating in the “IT&CMA 2015” Trade Show at Central World recently. Dr. Chai Nimakorn, Chairman Committee Managing Director of Grand Sport Group Co., Ltd, recently has launched “Grand Sport Winter Collection 2015 - 2016” to promoted a new products of Grand Sport Group Co., Ltd at Ballroom of The Grand Fourwings Convention Hotel, Srinakarin and Mr. Kiatisak Senamuang (Zico), Coach of Thailand National Football team participated in this event. Asst. 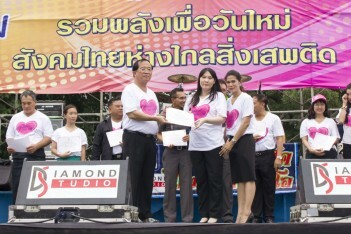 Prof. Wutisak Lapcharoensap, President of Ramkhamhaeng University, recenty presented the certificates to Ms. Tippawan Laosuwan, Assistant Human Resources Manager of The Grand Fourwings Convention Hotel Bangkok, Srinakarin that hotel has participated “Against Substance Abuse” at Ramkhamhaeng University. 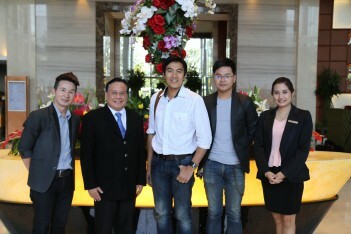 Mr. Supachai Jirapojaphorn, Executive Assistant Manager of The Grand Fourwings Convention Hotel Bangkok, presented welcome bouquets of flowers to Miss Angsumalin Sirapatsakmayta (Patty) and Miss Preechaya Pongthananikorn (Ice) on their occasion of a photo shooting for the “In Magazine” at the hotel pool recently. M.R.L. 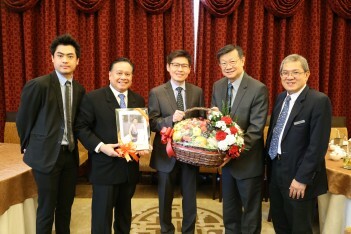 Sukhumphan Boriphat (Standing from left), Governor of Bangkok, recently received a welcomed bouquet of flower from Mr. Viroon Jirapojaporn (Standing from right), Financial Director of The Grand Fourwings Convention Hotel Bangkok, Srinakarin on his occasion come to visited the hotel. 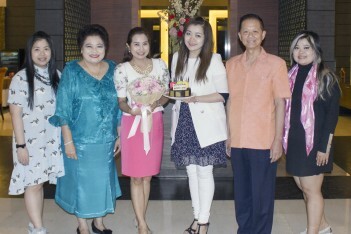 Mr. Worravit Pholab, Director of Food and Beverage of The Grand Fourwings Convention Hotel Bangkok, recently presented a lucky draws prize of the Diamond Pendant for lucky winner on “Valentine’s Day Party” at the hotel’s Grand Cafe Restaurant. 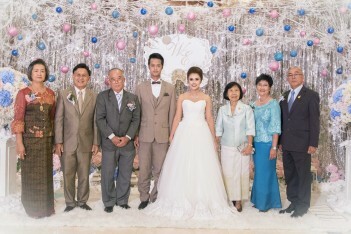 333 Srinakarin Road Huamark, Bangkapi Bangkok 10240, Thailand.